Born in 1711 to a prosperous Scottish family, David studied Philosophy at Edinburgh University and might well have been set for high state office or a leading position in academic philosophy, had not his lifelong atheism intimidated the establishment. Nonetheless, supporting his family as a librarian, historian, diplomat, and political essayist, he came to be intimate with many of the luminaries of the new learning sweeping Europe including Jean-Jacques Rousseau, Adam Smith and Alexander Carlyle. 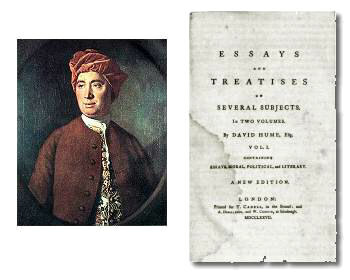 David Hume is now generally considered the founder of both the Scottish enlightenment and the centrepiece of the British tradition of empirical philosophy. His first major attempt at philosophical writing, the voluminous 1739 Treatise of Human Nature, fell, as he put it “dead-born from the press”. An Enquiry Concerning Human Understanding appeared in 1751, an acknowledgement by Mr Hume that the simpler, shorter version is the better for actually getting humans to understand things, an idea with which we heartily concur. The central themes of the book are that very little of what we think we know can actually be derived from any idea that there are actual necessary connections between observed phenomena. We assume that certain things are connected just because they commonly occur together, but a genuine knowledge of any connection is mere habit of thought. So, a severe skepticism is the only rational view of the world. But what about billiard balls? We assume that the cue causes the ball to move, thorough Humean skepticism would deny this. Ah! there is, as he himself put it, the David Hume the philosopher, and the David Hume who plays billiards. We should not let philosophy interfere too much with real life. “Be a philosopher; but amidst all your philosophy; be still a man”. Moral philosophy, or the study of human nature, may be treated in two ways. The simple, popular, philosophy of Man born for action, taste and sentiment; which by appeal to feelings, moulds the heart. Or the Abstruse philosophy of reasoning and speculation- unpopular & tricky but able to diffuse through to the lawyer, soldier and politician. All our Ideas come from sensory Impressions (well, perhaps except the missing shade of blue). You can’t dispute this- give me an idea which hasn’t come from an impression? The Idea of a ‘golden mountain’ comes from impressions of ‘gold’ and ‘mountain’ and of “God” from extensions of ourselves. We associate ideas because of their Resemblance (we see a painting, think of the original), their Contiguity (closeness in time/place) or their perceived cause-and-effect (think of a wound â€“ we cannot avoid thinking of pain). But there is a distinction between relations of ideas and matters of fact- Adam wouldn’t have known that water drowns. Stones might go up, or billiard-balls not rebound. We believe things when we hold a vivid, lively, forcible, firm, steady, more intense conception, which may not sound very philosophical- but we agree about the thing. Resemblance livens ideas powerfully, as with the Catholic mummeries. We assume one thing is caused by another just by the habitual assumption that things are often found together- it is not a reliable assumption. My sceptical friend argues that religion has no part in politics, and therefore the two ought not to be mixed. He misses the point that people do mix the two, no amount of ‘ought’ is equal to ‘is’. Animals as well as men learn from experience, as when the dog fears the whip. Our Laws are based on punishment – that same effect will have same cause. But ‘Cause’ is mere constant conjunction, we never really discover anything but one event following another. There is no such thing as chance in the world, yet nothing is more free than the imagination of man. There are always causes, even if the Power behind them is hidden from us, as with medicines or clouds. Miracles shouldn’t be believed, unless it would be even more miraculous not to believe. All religions with miracles say that ‘miracles prove other religions wrong’ (which is impossible). If God knows all, then he is the author of all criminality. There need be no fear that philosophy should undermine our reasonings in common life, but we can be sceptical as to moral or religious results. Check out other philosophy books; Is there abstract reasoning? Is there testability? No? Then it is not philosophy. Mr Hume is an engaging writer, so we hope to have captured as much of his style as possible. Fortunately for the editor, Mr Hume is also extraordinarily fond of repeating the same points over and over, giving long-winded explanations and a dozen examples where one or two would do. As a result it has been no particularly difficult task to squash 52,000 words down to 6500 while retaining the charm of eighteenth century Scots spellings and punctuation. Impressions: The actual sense-information which enters our minds, before we begin to process it. Imagination is merely what happens when we connect together existing ideas. Association: We put ideas together because they are similar, but it is wrong to assume that they are therefore connected. Contiguity: Similarity in time or place. Belief: Basically, just very strong Ideas. Power: The hidden force that makes things act. MOST of the principles, and reasonings, contained in this volume, appeared in a work called A Treatise of Human Nature, published not long after the author left college. But not finding it successful, he was sensible of his error in going to the press too early. Yet several writers, have taken care to direct all their batteries against that juvenile work, a practice very contrary to all rules of candour and fair-dealing. Henceforth, the Author desires, that the following Pieces may alone be regarded as containing his philosophical sentiments and principles. Moral philosophy, or the science of human nature, may be treated after two different manners: The one considers man chiefly as born for action, influenced by taste and sentiment. This species of philosophers select the most striking observations from common life, they make us feel the difference between vice and virtue. This easy philosophy enters more into common life, moulds the heart and affections and will always be preferred by the generality of mankind. The other species of philosophers are more abstruse – they consider man as a reasoning rather than an active being and regard human nature as a subject of speculation. They think it a reproach that philosophy should talk of truth and falsehood, vice and virtue, beauty and deformity without being able to determine the source of these distinctions, but such abstract reasoners seem to have enjoyed only a momentary reputation for it is easy for such profound thinkers to commit a mistake in their subtle reasonings, and one mistake is the necessary parent of another. To plead on their behalf we can say that just as the anatomist presents the most hideous and disagreeable objects; yet his science is useful to the painter in delineating even a Venus or an Helen. So it is a worthy philosopher who succeeds in delineating the parts of the mind, in which we are all so intimately concerned. Though a philosopher may live remote from business, the genius of philosophy, if carefully cultivated, must gradually diffuse throughout society and bestow correctness on every art and calling. The politician will acquire greater foresight, the lawyer finer principles and the soldier more caution. The most perfect character is supposed to lie between those extremes. Man is a sociable no less than a reasonable being. Be a philosopher; but amidst all your philosophy; be still a man. Every one will readily allow, that there is considerable difference between perceptions of the mind, like when a man feels heat, and when he afterwards recalls the memory of this sensation. If you tell me that any person is in love, I easily understand your meaning, but can never mistake that conception for the real passion, for even the colours of poetry can never paint natural objects. Therefore, we may divide perceptions into two classes. The less forcible and lively are commonly called Thoughts or Ideas. The other species I call Impressions, employing the word in a sense somewhat different from usual to mean the more lively perceptions as when we hear, or see, or feel, or love, or hate. When we think of a golden mountain, we only join two consistent ideas gold and mountain, with which we are already acquainted. We can conceive of a virtuous horse because we can conceive of virtue and unite it with the shape of a horse. Even the idea of God arises from our reflecting on the operation of our own minds and augmenting its qualities without limit. To express myself in philosophical language, all our ideas are copies of impressions. We always find that every idea is copied from a similar impression. Those who would disagree have only one, easy, method of refuting this: let them produce an idea which is not derived from this source. There is, however, just one phenomenon which may prove that it is not absolutely impossible for ideas to arise independent of impressions. Suppose a person, enjoying good sight, be presented with all the shades of blue from the deepest to the lightest, except a single one. Even if he has never had fortune to meet with the missing shade I believe it will be possible for him to imagine it. However, this instance is so singular that it does not merit that we alter our general maxim. Here, therefore, is a proposition which may banish jargon and make every dispute equally intelligible: When we entertain any suspicion that a philosophical term is employed without meaning or idea (as is too frequent), we need but enquire, from what impression is that supposed idea derived? It is obvious that different ideas are connected, yet I do not find that any philosopher has attempted to enumerate the principles of association. To me, there appear to be only three principles of connexion among ideas, namely, Resemblance, Contiguity in time or place, and Cause and Effect. A painting naturally leads our thoughts to the original (Resemblance): mention of one room in a building introduces enquiry concerning the others (Contiguity): and if we think of a wound, we can scarcely forbear reflecting on the pain which follows it (Cause and Effect). All the objects of human reason may be divided into two kinds: Relations of Ideas, and Matters of Fact. Of the first kind are the sciences of Geometry, Algebra and Arithmetic – for propositions like to three times five equals half of thirty express a relation between numbers discoverable by mere thought alone. The second kind, Matters of Fact, are not ascertained in the same manner nor is our evidence for their truth, however great, of a like nature. The proposition the sun will not rise tomorrow is still an intelligible proposition. Therefore, let us enquire what is the evidence which assures us of any real existence or of matters of fact. This part of philosophy has been little cultivated, so our doubts and errors may perhaps be excused. I shall venture to affirm, as a general proposition which admits of no exception, that knowledge of matters of fact seem to be founded on the relation of Cause and Effect, that the knowledge arises entirely from experience when we find that particular objects are constantly conjoined with each other. Let an object be presented to a man of ever so strong natural reason; if that object be entirely new to him, he will not be able, by the most accurate examination of its sensible qualities to discover any of its causes or effects. Adam could not have inferred from the fluidity of water that it would suffocate him, nor from the warmth of fire that it would consume him. We fancy that from our first appearance in the world we could have inferred, without experience, that one billiard ball would communicate motion to another or that a stone raised in the air without support would fall. If we could pronounce concerning such effects, without consulting past observation, after what manner, I beseech you, must the mind carry out this operation? Is there anything a priori which might prevent the stone from moving upwards or the or the billiard ball from remaining at rest? In all our reasonings the mind can never find the effect in the supposed cause. The utmost effort of human reason is to reduce the many effects of natural phenomena to a few general causes. Thus, the law of motion, assisted by geometry, allows us to devise the parts of a machine. We have deduced laws of motion, gravity and elasticity. Yet the law that governs these, established by nature, remains totally shut up from human curiosity. The observation of human blindness and weakness is thus the result of all philosophy, and meets us at every turn. What is the nature of our reasoning concerning matter of fact? the proper answer seems to be that they are founded on the relation of cause and effect. When we ask What is the foundation of our understanding of cause and effect? it may be replied, Experience. But if we sift further and ask What is the foundation of experience this implies a new question which may be of more difficult solution. Nature has kept us at a great distance from all her secrets, and has afforded us only the knowledge of a few superficial qualities of objects. Our senses inform us of the colour, weight and consistence of bread, but neither sense nor reason can ever inform us of those qualities which fit it for the nourishment of humans. Sight or feeling conveys an idea of the motion of bodies, but as to the wonderful force which carries a moving body forever in a continued change of place and which bodies never loose but by communicating it to others, we cannot form even the most distant conception. The bread which I eat nourishes me, but does it follow that other bread must also nourish me at another time? The consequence seems nowise necessary. It is a consequence drawn by the mind, a process of thought, which wants to be explained. When I have found that such an object has always been attended with such an effect then I foresee that similar objects will be attended with similar effect. What may be the medium which enables the mind to draw such an inference I confess passes my comprehension. In reality, all arguments from experience are founded on the similarity we discover among natural objects. Though none but a fool or a madman will ever pretend to dispute the authority of experience, it is surely for the philosopher to examine the principles which give this mighty authority to experience. You must confess that the inference is not intuitive; neither is it demonstrative: while to say that it is experimental is begging the question. While it is certain that the most ignorant peasants – nay infants, even brute beasts learn the qualities of natural objects by observing the effects which result from them, yet no reading or enquiry has yet been able to give me satisfaction in a matter of such importance. The passion for philosophy, like that for religion, which aims at the correction of our manners and extirpation of our vices may only serve by imprudent management to foster the predominant inclination. There is, however, one species of philosophy little troubled by this inconvenience, namely the Academic or Sceptical philosophy. Every passion as of arrogance, pretension or credulity is mortified by it, save for the love of truth. By flattering none, it gains few partisans; by opposing so many follies it raises to itself an abundance of enemies. We need not fear that this philosophy should ever undermine our reasonings of common life, for, whatever we may conclude, nature will always maintain her rights and prevail in the end over any abstract reasoning. Suppose a person endowed of the strongest faculties of reason be brought on a sudden into the world; he would observe a continual succession of objects and events following each other; but he would never be able to discover anything farther. He would not be able to reach the idea of cause and effect. Suppose again, that he acquired more experience and saw objects and events to be constantly conjoined together; what is the consequence? He infers from the existence of one object from the appearance of the other, but never acquires any knowledge of the secret power by which one object produces the other. This inference from experience is Custom or Habit, the great guide of human life. But, though our conclusions from experience carry us beyond our memory and senses and assure us of matters of fact, yet some fact must always be present to the memory of senses from which we may proceed in drawing these conclusions. But you cannot proceed after this manner in infinitum, you must at last terminate in some fact present to your memory or senses; or else allow that your belief is without foundation. These operations are a species of natural instincts, which no reasoning or process of thought is able either to produce or prevent. At this point it would be very allowable for us to stop our philosophical researches. In most questions we can never make a single step farther; and in all questions we must terminate here at last. As to readers of a different taste, the following enquiries may be of interest. Nothing is more free than the imagination of man; though it can never exceed the original stock of ideas furnished to it by the internal and external senses. It can feign a train of events, with all the appearance of reality, conceive them as existent, and paint them out with every circumstance that belongs to historical fact. Wherein consists the difference between a fiction and a belief? The difference between fiction and belief lies in some sentiment or feeling which is annexed to the latter, not to the former, and which depends not on the will, nor can it be commanded at pleasure. It must be excited by nature from the particular situations in which the mind is placed. Were we to attempt a definition of this sentiment, we should, perhaps, find it very difficult, if not an impossible, task; just as endeavouring to define the feeling of cold or the passion of anger to a creature who never had any experience of these sentiments. The proper name of this feeling is Belief. Belief is nothing but a more vivid, lively, forcible, firm, steady conception of an object, than the imagination alone is ever able to obtain. These terms may seem un-philosophical, but, provided we agree about the thing, it is needless to dispute the terms. Let us allow that the sentiment of belief is nothing but a conception more intense than what attends mere fictions and arises from customary conjunction of objects. If I hear the voice of a person with whom I am acquainted coming from the next room I immediately paint out to myself the person together with all the surrounding objects. The ceremonies of the Roman Catholic religion may be considered as instances of the same nature. The devotees of that superstition plead in excuse for their mummeries that they enliven their devotion and quicken their fervour by shadowing out the objects of faith. 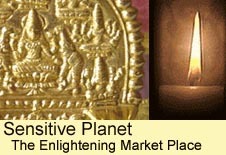 I shall only infer from these practices that the effect of resemblance in enlivening ideas is very common. We may add force to these experiments by considering the effects of contiguity as well as resemblance. The thinking on any object readily transports the mind to what is contiguous; but only the actual presence of an object transports it with superior vivacity. For this reason superstitious people are fond of the reliques of saints and holy men. Suppose that a friend, who had been long absent, were presented to us; this object would instantly revive its correlative idea and recall to our thoughts all past intimacies. In such phenomena, a belief in the correlative object is always presupposed. Contiguity to home can never excite our ideas of home unless we believe that it really exists. This transition of thought from cause to effect proceeds not from reason but derives altogether from custom and experience. This is the whole operation of the mind, in all our conclusions concerning matter of fact and existence. Here, then, is a kind of pre-established harmony between the course of nature and the succession of our ideas. Though the powers and forces of that nature be wholly unknown to us; yet our thoughts and conceptions go on in the same train as all the other works of nature. As nature has taught us the use of our limbs, without giving us knowledge of the muscles and nerves, so she has implanted in us an instinct which carries forward thought in a corresponding course to that which she has established among external objects; though we are ignorant of those powers and forces on which this regular course and succession totally depends. If a dye with a number of spots on four sides, and an other number of spots on the two remaining sides, it would be more probable that the former would turn up than the latter. If it had a thousand sides, with only one side different, the probability would be much higher, and our expectation of the event more steady and secure. This form of reasoning may seem trivial and obvious; but it may afford matter for curious speculation. The mind is carried more frequently to that which it meets the oftener. This concurrence of several views in one particular event begets immediately, by an inexplicable contrivance of nature, the sentiment of belief. There are some causes, which are entirely uniform and constant in producing a particular effect. Fire has always burned, and water suffocated every human creature: The production of motion by impulse and gravity is a universal law, which has hitherto admitted of no exception. But rhubarb has not always proved a purge, nor opium a soporific to every one who has taken these medicines. It is true when any cause fails of producing its usual effect, philosophers ascribe this not to any irregularity in nature; but suppose that some secret causes, in the particular structure of the parts, have prevented the operation. For my part, I shall think it sufficient if the present hints excite the curiosity of philosophers. The great advantage of the mathematical sciences above the moral is that being sensible, they are always clear and determinate. An oval is never mistaken for a circle, nor an hyperbola for an ellipsis. But the finer sentiments of the mind and the various agitations of the passions, though really in themselves distinct, easily escape us. Ambiguity, by this means, is gradually introduced into our reasonings: Similar objects are readily taken to be the same: The conclusion becomes at last very wide of the premises. One may safely affirm that, if we consider these sciences in a proper light, their advantages and disadvantages nearly compensate each other, and reduce both of them to a state of equality. The chief obstacle, therefore, to our improvement in the moral or metaphysical sciences is the obscurity of the ideas, and ambiguity of the terms. There are no ideas in metaphysics more obscure and uncertain than power, force, energy, or necessary connection. We shall, therefore, endeavour, in this section, to fix, if possible, the precise meaning of these terms. It seems a proposition which will not admit of much dispute, that it is impossible for us to think of any thing, which we have not antecedently felt, either by our external or internal senses. To be fully acquainted, therefore, with the idea of power or necessary connexion, let us search for all the sources from which it may possibly be derived. The scenes of the universe are continually shifting, and one object follows another in an uninterrupted succession; but the power of force which actuates the whole machine is entirely concealed from us. We know that heat is the attendant of flame; but what is the connection between them we have no room so much as to imagine. Since, therefore, external objects give us no idea of power or necessary connection, let us see if whether this idea be derived from reflexion on the operations of our own minds. We are every moment conscious of internal power; that by the simple command of our will, we can move organs of our body, or direct the faculties of our mind. We shall proceed to examine this pretension. First; is there any principle in nature more mysterious than the union of soul with body? Were we empowered, by a secret wish, to remove mountains or to control the planets in their orbits, this extensive authority would not be more extraordinary, nor more beyond our comprehension. Secondly; We are not able to move all the organs of the body with a like authority. Why has the will an influence over the tongue and fingers, not over the heart and liver? Thirdly; We learn from anatomy, that the immediate object of power in voluntary motion, is not the member itself which is moved, but certain muscles, and nerves, and animal spirits, and, perhaps, something still more minute and unknown. We may therefore conclude that our idea of power is not copied from any sentiment or consciousness of power within ourselves, when we give rise to animal motion, or apply our limbs, to their proper use and office. Shall we then assert, that we are conscious of a power or energy in our own minds, when, by an act or command of our will, we raise up a new idea? I believe the same argument will prove, that even this command of the will gives us no real idea of force or energy. First; Do we pretend to be acquainted with the nature of the human soul and of an idea, or the aptitude of the one to produce the other? Secondly; The command of the mind over itself is limited. Our authority over our sentiments and passions is much weaker than that over our ideas. Thirdly; This self-command is very different at different times. A man in health possesses more of it than one languishing in sickness. We are more master of our thoughts in the morning than in the evening: fasting than after a full meal. The generality of mankind never find any difficulty in accounting for the more common and familiar operations of nature – such as the descent of heavy bodies, the growth of plants, or the generation of animals. In all these cases, effect is forever infallible in its operation. It is only on the discovery of extraordinary phenomena, such as earthquakes, pestilence, and prodigies that they find themselves at a loss to assign a proper cause. It is usual for men, in such difficulties, to have recourse to some invisible intelligent principle. Thus, according to some philosophers, every thing is full of God. They rob nature, and all created beings, of every power, in order to render their dependence on the Deity still more sensible and immediate. If we would have a philosophical confutation of this theory, perhaps the two following reflections may suffice. First; it seems to me that this theory is too bold to carry conviction. Though the chain of arguments were ever so logical, there must arise a strong suspicion that we are got into fairy land. Secondly; We are ignorant of the manner in which bodies operate on each other: But are we not equally ignorant of the manner or force by which a mind, even the supreme mind, operates on itself or on a body? Whence, I beseech you, do we acquire any idea of it? But to hasten to a conclusion of this argument, which is already drawn out to too great a length. It appears that we never can, by our utmost scrutiny, discover any thing but one event following another, without being able to comprehend any force or power by which the cause operates, or any connection between it and its supposed effect. Every idea is copied from some preceding impression or sentiment; and where we cannot find any impression we may be certain that there is no idea. But when many uniform instances appear, and the same object is always followed by the same event; we then begin to entertain the notion of cause and connection. This point of view we should endeavour to reach, and reserve the flowers of rhetoric for subjects which are more adapted to them. It might reasonably be expected in questions which have been canvassed and disputed since the first origin of science and philosophy that the meaning of all the terms should have been agreed upon. In the long disputed case of liberty and necessity the expressions are still ambiguous and undecided, so that the whole controversy has hitherto turned merely upon words. We shall begin by examining the doctrine of necessity. It is universally allowed that matter, in all its operations, is actuated by a necessary force and that every natural effect is so precisely determined by the energy of its cause that no other effect, in such particular circumstances, could possibly have resulted from it. In a like manner, there is great uniformity among the actions of men, in all nations and ages, and that human nature remains still the same in its principles and operations. The same motives always produce the same actions: The same events follow the same causes, be they ambition, avarice, self-love, vanity, friendship, generosity or public spirit. Study well the temper and actions of the French and English: You can transfer most of the observations you have made of the former to the latter. Mankind are so much the same in all times and places. Should a traveller, returning from a far country, bring us an account of men who were entirely divested of avarice, ambition or revenge; who knew no pleasure but friendship, generosity, and public spirit; we should immediately detect a falsehood, as certainly as if he had stuffed his narration with dragons and miracles. Why is the aged husbandman more skilled than the younger? Because there is always a certain uniformity in the operation of the sun, rain and earth. We should not, however, expect that this uniformity of human actions should be carried to such a length as that all men, in the same circumstances, will always act in precisely the same manner, without making any allowances for the diversity of characters, prejudices and opinions. Such uniformity in every particular is found in no part of nature. Philosophers find many springs and principles in nature, which are hid by their remoteness or minuteness. The peasant can give no reason for a clock having stopped but that it does not go, but an artisan finds some fault in a spring, or the pendulum. From the observation of several parallel instances, philosophers form a maxim of cause and effect. For instance- the human body. Even when medicines do not work in their usual way, the philosopher and physician are still not tempted to deny the usual uniformity of working. Likewise, the irregular resolutions of men, as when a person of obliging disposition gives a peevish answer. He may have the toothache, or not have dined. The internal principles and motives may operate in a uniform manner; in the same way the wind and clouds are supposed to be governed by steady principles, even if they are not discovered by human enquiry. The mutual dependence of men is such that scarce any human action happens without some reference to other people. A prisoner, conducted to the scaffold, foresees his death as certainly as being from the guards, as from the axe. A man who leaves a gold purse on the pavement at Charring Cross at noon may expect it to fly away like a feather. Above half of human reasonings contain inferences of a like nature. What then, are liberty and necessity? By liberty we mean a power of acting or not acting, according to the determinations of the will, in circumstances consistent with matter of fact and with itself It is universally allowed that nothing exists without a cause- chance being a merely negative word. If anyone can define a cause without comprehending a necessary connection as part of the definition; then I shall readily give up the whole controversy. There is no more blameable method of trying to refute something than by a pretence of its danger to religion and morality. When an opinion leads to absurdities, then it is false. Because it is dangerous does not make it false. All human laws are founded on rewards and punishments, supposing that these motives have a uniform action on the mind. Men are not blamed for such actions as they perform ignorantly. Why? Because the principles of these actions are momentary, and terminate in them alone. It is therefore easy to prove that liberty is essential to morality. The only proper object of hatred or vengeance is a person or creature endowed with thought and consciousness. The ultimate author of all our volitions is the Creator, and, like a man who fired an explosive, it does not matter if the fuse is long or short, he is still responsible for the results, good or ill. That which produces the first is author of all the rest, we may plead lack of foresight for man, but not so for God. He foresaw and intended all the actions we call criminal (both moral and physical), so we must assume either that they are not criminal or that it is the Deity, not man, who is responsible. Some derive comfort from the ancient Stoic topic of consolation in that all ills are goods to the universe, but this will not appeal to a man suffering the agony of gout. First, animals as well as men learn from experience. Is it not experience which makes the dog apprehensive when you lift the whip to beat him, or make respond to his name? Secondly, It is impossible that this inference of the animal can be founded on argument or reasoning: Neither are children, or the generality of mankind: Neither are philosophers, who, in the active parts of their life are governed by the same maxims as the vulgar. Animals learn much from observation, but there are many parts which derive from the hand of nature. These we denominate Instincts. It is as much instinct that teaches man to avoid fire as much as that which teaches a bird the whole art of incubating its nursery. Evidence for the truth of our Christian religion is founded on the testimony of eye-witnesses to the miracles of our saviour, by which he proved his divine mission. Our evidence is then less than that of our senses, it is external evidence and not brought home to everyone’s breast by the immediate operation of the holy spirit. I flatter myself that I have discovered an argument, which, if just, will, with the wise and learned, be an everlasting check to all kinds of superstitious delusion, and consequently will be useful as long as the world endures. A miracle is a violation of the laws of nature. It is no miracle that a man, seemingly in good health, should die of a sudden; such a death, though unusual, has frequently been observed. But it is a miracle that a dead man should come to life; because that has never been observed. There must, therefore, be a uniform experience against every miraculous event, otherwise it would not merit the appellation. When anyone tells me that he saw a dead man restored to life, I consider whether it be more probable that this person deceive or be deceived, or that the fact should really have happened. I weigh the one miracle against the other. If the falsehood of his testimony would be more miraculous than the event which he relates; then, and not till then, can he pretend to command by belief or opinion. Part II In the foregoing we have supposed that testimony of a miracle may amount to a proof, but it is easy to shew that we have been too liberal. First, there is not to be found in all history any chroniclers of a miracle who are entirely above suspicion. Secondly. The passion of surprise or wonder, being an agreeable emotion, tends towards the belief in miracles, even among those who must hear only stories. Eloquence leaves little room for reflection. Thirdly. it forms a strong presumption against supernatural revelations that they chiefly abound among ignorant and barbarous nations. It is strange a judicious reader is apt to say that such prodigious events never happen in our days. Fourth. Testimony that a religion is proved by miracles, must confound itself. The religions of ancient Rome, Turkey, Siam or China abound in miracles. But to claim that the miracles of one’s religion confound all others, must likewise destroy all credit in miracles. I need not add the difficulty of detecting falsehoods. Even a court of judicature, with all the authority, accuracy and judgement it can employ, often finds itself at a loss to distinguish truth from falsehood. The wise and learned commonly think the infancy of new religions too small a matter to deserve regard, and when they would later detect a cheat, the season is past and the witnesses perished. It is experience alone which gives authority to human testimony; and it is the same experience which assures us of the laws of nature. Our most holy religion is founded on Faith, not reason, and whoever assents to it is conscious of a continued miracle in his own person, which subverts all the principles of his understanding. I was lately engaged in conversation with a friend who loves sceptical paradoxes. You admire, he said, the singular good fortune of philosophy that it requires liberty above all other privileges, and flourishes with free opposition and argument. Yet the pernicious [religious] bigotry of this present age, which you so dislike, is surely the offspring of philosophy. If you please, he said, I shall suppose myself to be Epicurus, standing before the Athenian people, and say: Oh ye Athenians, the philosophers, not satisfied with the traditions of your forefathers and priests, indulge in rash curiosity by trying to see how far they can establish religion upon principles of reason, and thereby excite argument. When, in my philosophical enquiries, I deny a providence and a future state, I undermine not the foundations of society, but advance solid principles. When we infer cause from effect, we must proportion one to the other. You find certain phenomena in nature. You seek a cause or author. Let your gods, therefore, be suited to the appearances of nature and not your supposed need to protect the honour of the gods. To assume a divine providence and supreme distributive justice in the universe, I would expect to see particular reward of the good and punishment of the bad. Reasons can only be drawn from effects to causes. Consider, instead, the world as an incomplete building, from which you can infer a superior intelligence which will, in time, leave nothing imperfect. The Deity is known to us only by his productions, and is a single being. We cannot make any analogy. No new fact can be inferred from the religious hypothesis; no event foretold. The argument, said my friend, is solid; politics should have no connexion with disputes on metaphysics and religion. There is one circumstance, I replied, which you have overlooked. Though I should allow your premises, I deny your conclusion. You conclude that religion can have no influence on life, because it ought not to; forgetting that men do not all reason as you do. Whether their reasoning is just or not, is of no importance. Further, that is a difficulty with your main topic; I doubt that a cause can be known only from its effect. It is only when two species of object are found to be constantly conjoined that we can infer one from the other; were an effect entirely singular I do not see that we can infer anything of its cause. So great are the number of philosophical reasonings which prove the existence of a Deity that many religious philosophers dispute whether any man can be an atheist. How can we explain this? The knights of old wandered to clear the world of dragons and giants, never doubting that such existed. Des Cartes recommends a universal doubt. But were such doubt possible (as it is not) it would be incurable, as having nothing from which to reason. It would seem that men are carried, by natural instinct, to repose faith in their senses and suppose the images of their eyes to be external objects. This table, which we feel hard, is believed to exist independent of our perception and external to our mind. But the slightest philosophy, forces us to depart from the primary instincts of nature, by teaching us that nothing can be present to the mind but an image or perception. The mind has never anything present to it but the perceptions, and cannot possibly reach any experience of their connection with objects. To have recourse to the supreme Being in order to prove the veracity of our senses, is surely making a very odd circuit. Thus the first philosophical objection to the evidence of our senses is that if such is rested on instinct, then it is contrary to reason, if rested on reason then it is contrary to natural instincts. If we take in our hand any volume; of divinity or school metaphysics, let us ask, Does it contain any abstract reasoning concerning quality or number? No. Does it contain any experimental reasoning concerning matter of fact or existence? No. Commit it then to the flames: for it can contain nothing but sophistry and illusion.